[Review] Click! Work Anytime, Live Anywhere. I’ll be honest about this – I was full of skepticism when I first approached “Click! 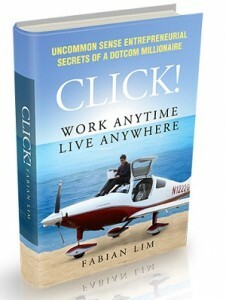 Work Anytime, Live Anywhere“, a self-help, “get rich”-type book from Singapore-based dotcom millionaire Fabian Lim. Serial entrepreneur Lim had made his fortune from creating and running a string of Internet businesses such as ClickMedia, as well as events company ClickEvents built around, yup, teaching people how to get rich by being Internet entrepreneurs. Truth is, I’ve always been wary of folks who essentially take shortcuts in life towards achieving success, and chief amongst those are these dotcom entrepreneur types that exploit technologies and find loopholes in systems and processes for their own gain. But to Lim’s credit, his book “Click! Work Anytime, Live Anywhere” thankfully doesn’t quite focus around how to build Internet businesses. Instead it looks at helping readers change their minds and attitudes about success – for example, Lim establishes various rules about entrepreneurial success. Much of it is common sense touted by other self-help books and compiled into a few chapters in here, but some of it is also uncommon sense that will make you lift your eyebrows at least a little bit. Lim also dedicates a fair portion of “Click! Work Anytime, Live Anywhere” detailing how best to build joint ventures, which he believes is a great way to leverage on the resources of partners to help grow your own businesses. He explains various JV models that an entrepreneur can look at – exploiting the “Law of Association” for mutual benefit – as well as steps to identify the right partners. But probably the most useful section for entrepreneurs is where he covers various personal productivity and time management tools to help busy, busy people to streamline their own workflows and processes. It’s evident Lim is a huge proponent of online and mobile apps that help you manage and save time. He touts the use of, for example, RescueTime or TimeDoctor for easy time-tracking, FocalFilter or SelfControl to minimize distractions, and ZigMail, MailStrom.co or Emailga.me to manage email clutter. There are many other such resources that he recommends, and to me that’s the most useful part about “Click! Work Anytime, Live Anywhere“. I’m still wary of Fabian Lim and his ilk, but I respect and applaud him for knowing exactly the lifestyle he wants and setting himself up to achieve all of that. If personal productivity and time management tools are what he advocates for an entrepreneur’s self improvement, I guess I don’t mind taking some shortcuts in life.